Although the date of 1661 is found on the chimney of “The Swan”, its history probably dates back to the fifteenth century which is indicated by the architectural features present in parts of the building. These include trees found in the structure, plus their branches; a “priest hole”, which is thought to have been used by local priests at the time of Oliver Cromwell (1649-1660), and a cellar where dead bodies were laid out, as it was thought that this was the coolest room in the village. During its long and varied history the building has also been used as a “whore house”, tea rooms and finally as a public house from around the start of the nineteenth century. The Swan Inn was an H&G Simonds house, these being the local brewers of Reading. They were closely related to the Simonds family who lived at Newlands and who were local bankers both in Reading and Wokingham. 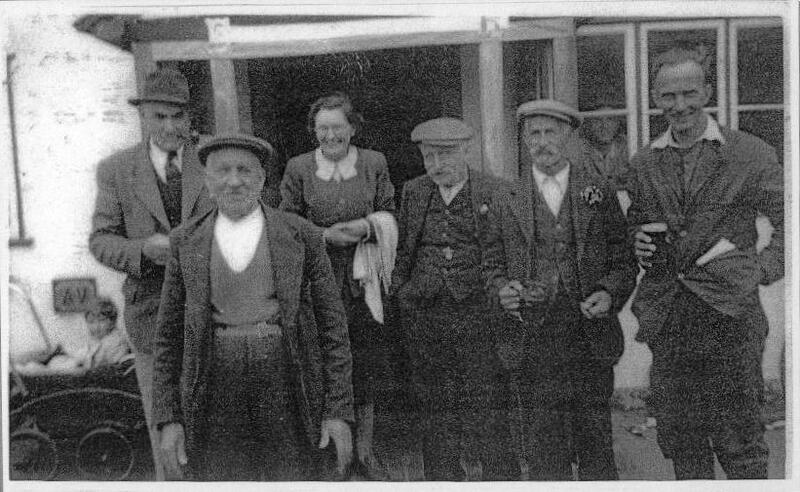 The earliest record discovered, so far, of the landlords of The Swan, can be found in Snares Directory of 1842, where a Mr. Maynard is listed as landlord (but in the 1841 Census he was described simply as a 'cordwinder' though with three people lodging with him and his wife). We also know from records that Elizabeth Pitcher was the licensee in 1853 when the rent was Eight Guineas per annum (£8.40p). In 2003 it was £36,000. The Quarter Sessions of 5th September 1815 identify a John Hall as a 'Victualler' of Hurst, and on the same day they list him as a 'Victualler' of Arborfield. Could this have been at the 'Swan', which was in the Liberty of Newland? 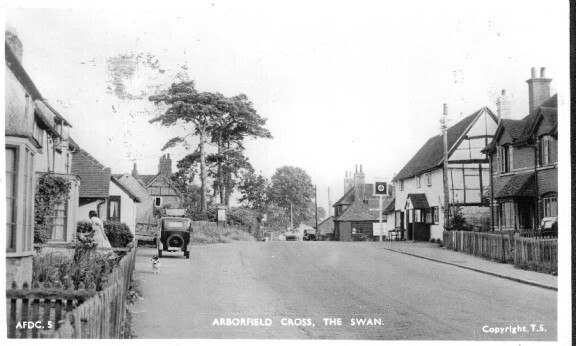 This detail of a postcard from a gentler age shows 'Sunrise' and the Swan, with people walking in the middle of what was then known as 'Arborfield Street'. Note the hedges in front of 'Sunrise' and lack of pavements. 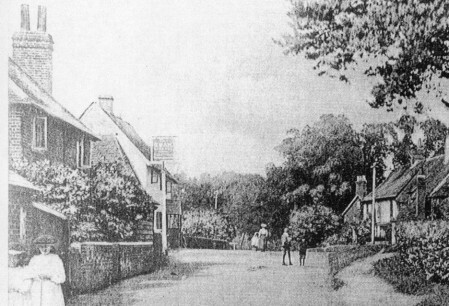 Even in the early 1950's when the Frith's postcard shown below was published, the car was not yet king and there was no continuous pavement on the Post Office side of the road, but by the 1960's, plans were drawn-up for a by-pass to the west of the village. (An electricity sub-station was erected behind 2 Chamberlain Gardens with cable extending behind Melrose Gardens in readiness for a new estate to be bounded by this by-pass, but both have since been removed). When Simonds merged with Courage and Barclay in 1962, the ‘pub’ became a Courage house and the hop-leaf sign was replaced by the cockerel. Even in the mid-1970's the beer (then still produced in Reading) was taken direct from the barrels, but after this, hand-pumps were installed. Since this time the owners have been Ansells, Inntrepreneur and then Nomura Bank, trading as the Unique Pub Company. Enterprise Inns closed the pub in early 2015 - to be converted into a pub-restaurant - finally bringing to an end a long association with live rock music. The restaurant didn't last very long, and the 'Swan' reverted to a pub. As of 2018, the building is closed and the freehold is for sale. The 'Swan' has long been used for celebration, and these two photos show some happy scenes, one from the 1920's and one from Coronation Day, 1953. 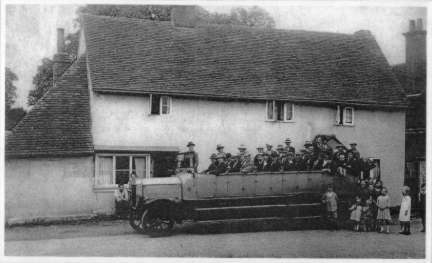 Click on the charabanc for a larger version of the picture. Front row: Nobby Holloway, Jack Povey.